BJP candidate Swami Yatendranand has started active campaigning to thwart allegations by opposition parties that he was a lesser-known name in the constituency. With elections round the corner, the Uttarakhand Congress has begun to woo minorities, particularly the Muslims. The unresolved issue of affiliation has put aided and self- financed medical institutions in a spot. The institutions are unsure if the next academic session will start on time. As the Lok Sabha elections draw near, every political party is harping on development issues. But the pathetic condition of a police chowki at Uttaranchal-UP border at Dumenpuri village, around 50 kms from Roorkee, is enough to show the lack of development here. The contribution of science institutions in Dehradun in the country’s quest about Antarctica has been immense. As many as 40 persons from various institutions in the city have been part of expeditions to icy continent with four to five persons getting an opportunity as a member of an expedition every year. Infer No DIT and SIR Rangers won their respective matches at the day-night Khalanga Cricket Tournament at Tapowan here today. 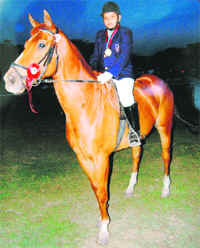 Uttarakhand’s Karan Walia left his mark by winning gold for the second time in a row at the nationally acclaimed dressage horse riding competition in Delhi at the recently concluded Delhi Horse Show. Uttarakhand Governor BL Joshi today inaugurated Dental Bhawan of the Indian Dental Association, Dehradun Chapter, at Kiduwala, Raipur. 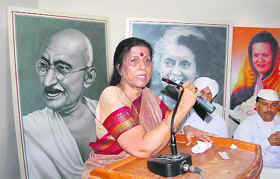 Former minister and Congress election incharge for the five parliamentary constituencies of Uttarakhand Indira Hariydesh has said if the Congress forms the next government at the Centre, efforts will be made to extend of industrial package of Uttarakhand till 2013. The Uttarakhand State Games, which were proposed for May, could be delayed due to the forthcoming Lok Sabha elections. It seems queer that Somnath Chatterjee, a politician who has to his credit a record of winning 10 Lok Sabha elections, is not involved in the current poll preparations, but is instead enjoying the serene environs of Rishikesh and Haridwar. A student of Class VI in a missionary school was raped by the school watchman at Loki colony in Lakshar area a few days ago. The matter came to light today when the girl’s mother returned from Delhi and the girl narrated the incident. A revenue clerk was nabbed accepting bribe from a farmer at the local bus stand by the Vigilance Department. Finally, the world's cheapest car Nano was put on display at the Oberoi Motors Majra, here this morning. DGP Subhash Joshi today convened a meeting to review the preparations for the upcoming Lok Sabha elections. On the second day of the IInd ONGC CMD Cup cricket tournament being played at the Abhimanyu Cricket Academy Grounds, Assam Aragons defeated Cauvery Cheetahs by seven wickets. A colourful programme was held to mark the golden jubilee celebrations of Raphael Ryder Cheshire International Centre here today. Mohsin, a 35-year-old three-wheeler driver, was killed in an accident which took place on Delhi-Haridwar highway here last night. Saurav has won the Uttarakhand State Open Men’s Tennis Tournament that concluded at Shanti Tennis Academy here today. In the final, Saurav outclassed Varun Walia in straight sets 6-3, 7-6 to lift the title. With summers picking up, a sudden rush of tourists was witnessed at Corbett National Park this weekend, leading to commotion at the main reception. Addressing a press conference here today, Yatendranand said he was in election fray only to work for people. He also expressed gratitude to party workers for their support. Madan Kaushik took a lead during the conference and put an end to the misgiving that BJP had opted for a weaker candidate after he withdrew his candidature. On the question of any factionalism or ill-feeling in the party workers, Kaushik said the ticket was given keeping in mind the benefit of people. On several occasions it was Kaushik who pitched in for the inexperienced Yatendranand, after a volley of questions were fired at him. In Roorkee too he addressed a gathering. A strategic meeting was also held in which all district executive members and representatives were apprised of the public contact programme. Kaushik and district chief Mayank Gupta urged party workers to remain united during the election. However, former chairman of Jhabreda Chaudhari Kulbir Singh criticised the BJP for not giving a ticket to backward caste candidates. To this, Kaushik argued that the Saini community despite having more numbers than Gujjars are not complaining and are with the party; so he should also follow suit. But after this altercation, Kulbir said that within a week he would apprise the party of his decision, leaving the leaders in a dilemma. Meanwhile, Samajwadi Party candidate Ambrish Kumar is trying to woo the saints. He visited Khadkhadi and Bhoopatwala areas today, and termed the saints as significant not only for Haridwar but also for the country. He said the BJP and Congress are using the saints for political purposes, but not giving them their right share of respect. Accusing the BJP government of “ignoring” the minorities and stalling all programmes initiated by the previous Congress government for their welfare, Uttarakhand Pradesh Congress Committee (UPCC) chief Yashpal Arya today announced he would expose the “communal approach” of the BC Khanduri government, especially its failure to reconstitute the state Waqf Board and the non-functioning of the Muslim Education Mission (MEM), at his election rallies. Arya said the Congress would make sure that modern scientific education was provided in madrasas. He claimed that during the ND Tiwari regime in Uttarakhand, the Congress government had made provisions for computers in madrasas. But this was discontinued with Khanduri taking over the reins in the state. “Now, everything is in a shambles,” he alleged. He claimed if the Congress formed government at the Centre, it would ensure that requisite funds and other assistance was provided to the state madrasas. Flaying the BJP government for making efforts to ensure that the minorities remained segregated from the mainstream, the state Congress president said during the previous Congress regime, the Union Government had started a 15-point Minorities Welfare Programme, which was discontinued by the Khanduri government. He pointed out that the Minorities Finance and Development Board had also been defunct. When contacted, chairman of the state media advisory committee Davinder Bhasin refuted the allegations. He said the Khanduri government had started special programmes for the minorities. The Garhwal university has issued a letter to self-financed colleges and institutions that till the time the issue of their affiliation is not sorted out, the admission exercise cannot be started. The order is expected to affect the UPPMT entrance test as well. All medical institutions were earlier affiliated to Hemwati Nandan Bahuguna Garhwal University that has now been conferred the status of central university. The state has 11 medical colleges (MBBS, BDS, BAMS and BHMS) in which admission is given to those on the UPPMT merit list. Out of the 11 institutions, nine are affiliated to Garhwal university and two Kumaon University. These colleges have 760 seats out of which 505 come in the government quota. Self-financed private colleges affiliated to Garhwal university have 35 seats allocated for the MBBS course, 50 for BAMS and 100 for BDS. Admission is on the basis of entrance tests. Uttaranchal Ayurvedic College director Ashwini Kamboj said the issue would be resolved and the entrance examination held on time. “We are holding talks with the government. The problem has arisen with Garhwal university being accorded the status of central university,” said Kamboj. The Balawali police chowki here has been set up to check the illegal use of the 100-year-old girder bridge, which had been discarded by the Railways around four years ago, by commuters of both states. Three policemen, including a head constable, have been deputed on round-the-clock duty here. The pathetic condition of the police post is reflected in its lack of even the basic infrastructure. In the name of the building, there is one small room with broken doors, cracked roof, floor and walls. The post has no electricity connection, forcing the cops to do their work in candlelight. There is no telephone. The cops have not even been provided with any chair or table. In the absence of any toilet or bathroom, the cops have to go to the toilet in the open. At the backyard of the old structure, the cops have set up a makeshift kitchen where they prepare food on their own. “To rest, we have borrowed cots from villagers,” said a cop on duty. Being a shortcut to Uttar Pradesh, these policemen has to keep strict vigil to check criminals from crossing into states after committing crimes. “Our counterparts (the UP police) has set up a chowki providing full facilities to their personnel on the other side of the bridge. Our authorities should also think on the same pattern,” he said. Dr Abhya Mishra, a scientist at DEAL who has been part of Indian team which visited Antarctica in 2002-03, recalls the contribution of Dehradun-based Central government departments in Antarctica right from development of infrastructure to carrying out research and other studies. “It’s a matter of pride that Dehradun has contributed so much to the Indian scientific cause in Antarctica,” he said. Mishra pointed out the role of DEAL, Dehradun, towards establishment of communication network in Indian stations at Antarctica. He said while maintaining communication in Antarctica was a very challenging task, DEAL ever since its inclusion from the 12th expedition onwards has been doing the job with utmost excellence. Dehradun-based Survey of India officials have also been playing a pivotal role and are also credited with preparation of maps of the proposed Larsemann hills station in Antarctica. Not to be left behind, scientists from the Wildlife Institute of India here, a top wildlife research institution of the country, have been regularly visiting Antarctica for carrying out studies of the penguin-dominated wildlife found in the region. Dr Satyakumar, scientist E at the Endangered Species Department of WII, has been among few scientists to visit Antarctica twice, his second visit concluding just a few weeks back. Other prominent institutions like Oil and Natural Gas Corporation Limited, Botanical Survey of India, Zoological Survey of India and IRDE have been frequently visiting Antarctica for conduct of studies linked to their respective departments. “Dehradun is blessed with a number of scientific institutions leading to the presence of big scientific fraternity here. Their services can be utilised in the promotion of science among the people specially the young,” said Prof Dhirendra Sharma, patron of the Uttarakhand Chapter of Science Writers Association. In the first match of the day, Infer No (DIT) team won their match against Brijesh XI by a margin of 58 runs. Batting first, Infer No went on to score 131 runs in their allotted 15 overs. It was a shaky start for Infer No as they lost their first wicket at the score of 21 runs in the third over. But thereafter, Harisha and Amresh fared well for Infer No. Harish was the top scorer with 25 runs and Amresh made 20 runs. For Brijesh XI, Anshul and Pankaj were the pick of the bowlers taking two wickets each. In reply, it was a poor batting display by Brijesh XI who could only manage to score 73 runs falling short of the target by 25 runs. They were all out in 11 overs. Anshul was the only one who reached double figures. He made 17 runs. For Infer No, Ankit took four wickets and Rajeev took two wickets. In the second match, SIR Ranger registered a convincing 137-run victory over the Invincible team. SIR Rangers won the toss and elected to bat. They piled up 172 runs in 15 overs. The openers gave the Rangers a fine start. Kamal and Navodit smashed 15 runs and 23 runs respectively. Soumya was the top-scorer with 64 runs off 33 balls hitting five fours and five sixes. For the Invincible team, Sakir, Monu and H Pundir took one wicket each. Chasing 173 runs, the Invincible team was all out for 35 runs in 13 overs. Uttam was the only batsman who showed some resistance to hit 15 runs. For SIR Rangers, Jagdish did the main damage. He bagged four wickets in his three-over spell. Karan was the sole representative from the state among the long list of 51 participants from across the country. He said that the competition was more intense this year due to the increase in the number of participants. Karan was inspired to take up horse riding because his father Vivek Walia is also a horse rider. “I had seen my father riding horses from my childhood. The charm of horse riding interested me so much that I decided to take up the sport in all seriousness,” said Karan. “Seeing my interest in the sport, my father bought three horses for me so that I could practice at any time of the day. This certainly helped me a lot,” he said. 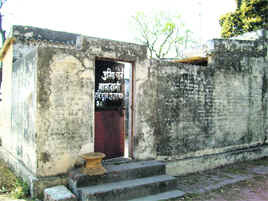 In the absence of training academies, Karan practiced at his father’s farmhouse everyday for at least two hours a day. He constantly receives guidance from his father as well as from his coach of three years, Nemichand. Apart from horse riding, Karan loves shooting and spends a lot of time shooting. He has also won a medal at the National Inter-School Shooting competition. He is a Class IX student and also excels in his studies. He wishes to join the Army after qualifying in the NDA examination. But he is interested in pursuing a career in horse riding and wants to participate at an international event when he grows up. Addressing the gathering, Joshi said as problems in the health sector were vast, cooperation between dental and medical associations and government organisations and industries was a must. The Governor said due to the changes in lifestyle, people were encountering dental problems that were earlier non-existent. He hoped Dental Bhawan would become the nerve centre for dental health. Principal secretary, health and medical education, Keshav Desi Raju said due to a shortage of trained doctors and paramedical staff, dental clinics at primary health centres were unable to cater to the needs of patients. He said the state was battling a major manpower crunch and called upon the Indian Dental Association to strengthen services in the state. Garhwal Commissioner Dr Umakant Pawar said dental services should be given primacy in the integrated system of medicines. “The involvement of dentists is a must in chalking out health policies for the state,” he said. In his address. Dr Ashwani Dobhal, president, IDA, said the bhawan would be an official centre for the dental fraternity for holding scientific conventions, professional interaction and carrying out dental and oral health-related programmes for the people of Uttarakhand. He said the Dehradun chapter of the association had been carrying out free dental checkup and treatment camps in the state. “We are laying special stress on oral and dental problems faced by the aged ,” Dr Dhobal said. Hariydesh, who was in city today to convene meetings with party leaders, said the Congress has always encouraged industrial development. Notably, NDA government had given a special industrial package for ten years to Uttarakhand in 2003. But the UPA government reduced it till 2007, only later to extend it for three years. The BJP had never wasted any opportunity to slam the Congress for reducing the tenure of the industrial package. Now, with elections ahead, the Congress is making attempts to woo the industrial community by promising them to take up the matter of extension of the industrial package till 2013. Speaking to mediapersons, Hariydesh claimed that the Congress is all set to form the next government. Without naming LKAdvani, she said that the Prime Minister in waiting is extremely upset because the opinion polls and the prevailing wave among the electorate indicate that the UPA is heading for a massive win. "The credit for the development of the state goes to the Congress government. The 108 emergency service was started under the National Health Mission. Besides, it was the Tiwari government that created the physical infrastructure, including roads and bridges," said Hariydesh. She flayed the Khanduri government for failing to continue development-oriented policies started by the Congress government. Lambasting the BJP government, Hariydesh said under the Prime Minister Gramin Sadak Yojna, funds amounting to Rs 8,000 crore were sanctioned by the UPA government for Uttarakhand, which have not been used. She said during his visit to Nainital, the PM had announced a special package of Rs 18,000, which also has not been utilised. The Uttaranchal Olympic Association is all prepared to stage the Games and had already submitted a budgetary proposal to the state government. But in all possibility, the budget may not be approved on time as the election code of conduct is already in force. As players from the state for the National Games in June were to be selected at the state Games, this process might not get completed in time. Only four state games have been organised since the inception of the state. Former Sports Minister Narayan Singh Rana had organised the first state games. But thereafter, due to internal bickering of the association, its working has been affected. To make more and more people take to sport, the Uttaranchal Olympic Association this time has planned to organise games in four districts of the state for which Dehradun, Haridwar, Kashipur and Haldwani have been selected. Three new sport will be included - horse riding, roller skating and rowing. The veteran communist, known for his ethics and high standards of political practices, is for first time in the last 40 years staying aloof from the poll scene and is in Uttarakhand along with his family. Somnath was spotted spending time at the Har-Ki-Pauri here accompanied by his wife Renu Chatterjee and two daughters. Their visit to Haridwar from Rishikesh was kept a secret and it was only after he was spotted at the famous ghats that the administration swung into action. A sub-inspector and two constables were sent to beef up security, although his personal security guards accompanied Chatterjee. City Magistrate Archana Grehawar was also not aware of his visit. After spending time at the ghats, Somnath visited the local market and interacted with tourists. Notably, the veteran politician who first entered Parliament after the 1971 Lok Sabha elections is not contesting this time due to his differences with the party. As of now, he is camping in Rishikesh since the past one week and writing a book on his experiences. The victim’s mother lodged a complaint against the accused. The miscreant Fabrial had good relations with the family of the victim. He is the father of five children with the youngest being 18-year-old who teaches in the same school. The father of the victim works in New Delhi in a private nursing home and her mother had gone to Delhi to visit him. She had left her daughter and two other children in the watchman’s custody. He abused the 13-year-old girl in her parents’ absence and even threatened her of dire consequences if she revealed the act to her mother. As soon as her mother came to know of the incident, she went to the school management and told them of their watchman’s dastardly act. Instead of taking action, the management tried to pacify her and pressurised her to keep the matter under wraps. The next day, she reported the matter to the police and lodged an FIR. CO Pankaj Bhatt arrested Fabrial and referred the girl for medical examination during which it was confirmed that the girl has been sexually harassed. Dharmendra Yadav, currently posted at Haridwar tehsil headquarters, was arrested by the sleuths red-handed while accepting Rs 2,000 as bribe. A trap was laid on the complaint of the farmer who had alleged that the clerk was asking for a bribe to maintain the farmer’s land record. Yadav was recently transferred from Roorkee to Haridwar tehsil. SP (Vigilance) VK Sharma said that in four years, the department has arrested as many as 12 government officials from Roorkee region for their involvement in corrupt practices. “To discourage such practices, the public should come forward to help the department whenever some government official asks for bribe,” said the SP. Chief secretary Indu Kumar Pandey took off the cloth bearing the label "Made in Uttarkhand" from the car, after which it was on display for residents. Nano was expected to reach the state capital yesterday, but got delayed as the truck carrying the cars was stranded at Saharanpur. It reached the city three days after it was launched across the country. The cars that arrived in Dehradun were dispatched from the Tatas Pantnagar Plant in the state, from where it is being manufactured. Giving details, Rakesh Oberoi, chairman of the Oberoi Motors, said one red coloured car has been put on display in Dehradun. He informed that there would be no test drive of the car, adding that bookings for Nano will be opened from April 9 to 25. Notably, manufacturing of Nano from Pantnagar will generate a revenue of Rs 200 crore annually in the form of VAT etc. During the meeting, discussions were held regarding the security arrangements to be made at the polling stations. Deliberations were also held regarding the Central forces required for the election. The DGP directed all officials to ensure that they perform their duties in an unbiased manner. IG (Intelligence) Anil K Raturi issued instructions regarding the security of VIPs. Others present during the meeting were ADGP (Administration) JS Pandey, ADGP (CID) Vijay Raghav Pant, IG (PAC) Ajay Kumar, IG (Garhwal) MA Ganapathy, IG (Kumaon) Ashok Kumar, IG (Prosecution and Modernisation) RS Meena and IG (Headquarters) JC Pandey. Batting first, Cauvery Cheetahs scored 120 runs for five wickets in 20 overs. The top scorers for Cauvery Cheetahs were PG Shrutikar (39 runs), DG Tilak (20 runs) and SKR Basha (20 runs). For Assam Aragons, Rajesh Bawa took two wickets. Assam Aragons reached the target for the loss of three wickets. The top scorers for Assam Aragons were P Dutta (35 runs) and N Das (30 runs). For Cauvery Cheetahs, Mamgain, P Raj and Arun took one wicket each. P Dutta of Assam Aragons was declared Man of the Match. In his welcome address, centre chairman Air Marshal (retd) BD Jayal said the foundations for selfless work laid by the founders were being strengthened. The institution has been working to provide relief to the disabled for over 50 years now. 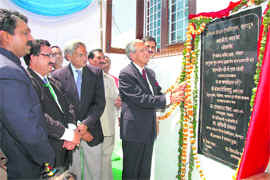 The chief guest, Governor BL Joshi, paid tributes to the founders, Lord Leonard Cheshire and Lady Sue Ryder. Neeraj Varma, who won a gold medal in floor hockey at the World Special Olympic Winter Games held in the USA was felicitated by the Governor. A number of overseas visitors representing Ryder Cheshire Foundation in Australia, New Zealand and the UK participated. According to the police, Mohsin, was on his way to Manglore at around 1 am on Sunday when an unidentified truck driver hit his vehicle (UA08-J 2392) from the front and fled away. The mishap occurred in front of the Maruti showroom in Sakumbri. Injured Mohsin was shifted to the civil hospital where he succumbed to his injuries, said police sources. A case has been registered on the complaint of the victim’s brother Irfan against the unidentified truck driver at Civil Lines police station here. In the doubles match of men’s open category, Saurav and Avinesh defeated the pair of Varun Walia and HM Bangari in straight sets 6-4, 6-4. In the 35 and above category, the pair of Pradeep Walia and HM Bangari outclassed Rahul and Dr Singh 9-4. In 45 and above category, Pradeep Walia and HM Bangari defeated Ajay and Rajkumar Sonkar 9-6. According to Corbett Park sources, there was a huge rush on Saturday and Sunday. With all the accommodations already booked, the rush was primarily of day visitors. And it was only after intervention of the police, that discipline could be maintained. Notably, there has been a big rush of tourists to Corbett in recent times, particularly in its tourism zones like Dhikala, Dela and others, and wildlife authorities have been contemplating creating other tourism opportunities inside the Park.